We have recently launched a new website for Somerset Hydroponics. 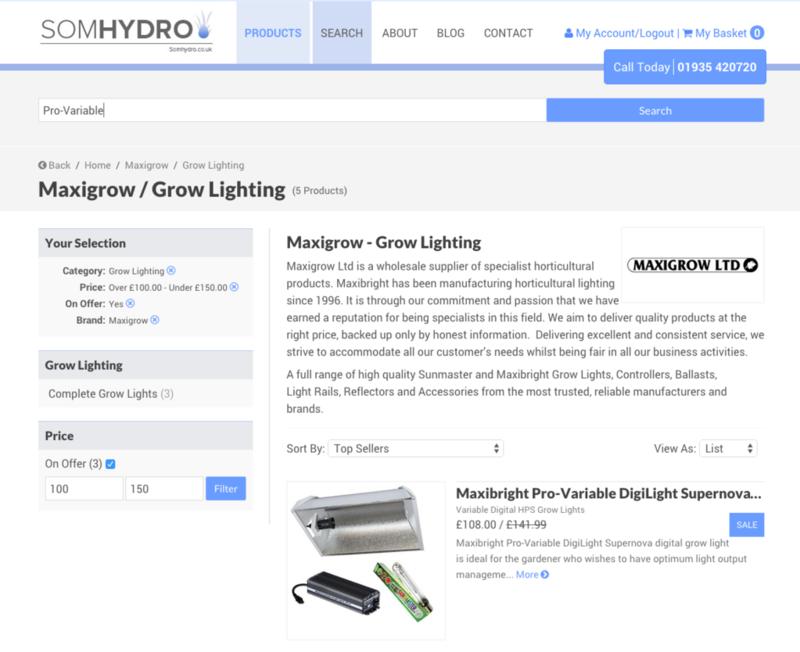 We have developed a powerful ecommerce platform for Somhydro that is responsive so works great on mobile devices. It has a dynamic customer relationship system so Somhydro can track spending habits and enable genuine customer relationships via visit insights, shipment notifications, email broadcasts and easy to use account system. The platform has extensive rich data functionality to deliver exceptional search engine exposure. For example, we have increased Somhydro’s site search results on Google from 700 to over 5000 to deliver thousands of landing pages for products and variants. The website has an expansive category system with filtering functionality to make it easy for customers to find the product they are looking for. It also allows detailed product data to help fully describe the products to customers using images, reviews, videos, downloads and branding. For products that have multiple variants we have developed an ultra flexible variation system with support for multiple custom options (e.g. size, colour, wattage) providing customers a straight forward method of selecting the correct variant of the product they wish to purchase. Here at Ziontech we thoroughly enjoyed working on this website. If your company is in need of a bespoke ecommerce solution please feel free to contact us to discuss your requirements.